It's been almost four months since I have picked up crocheting.... and it is addicting in every way. I just wish I took pictures of all the items I made and gave away as gifts. So I want to share a couple of the projects I did manage to snap a picture of as well as some other lovely patterns to try out. My first project was the one proposed over at Craftyminx's online Crochet School, which I eagerly followed and still refer to in times of need. 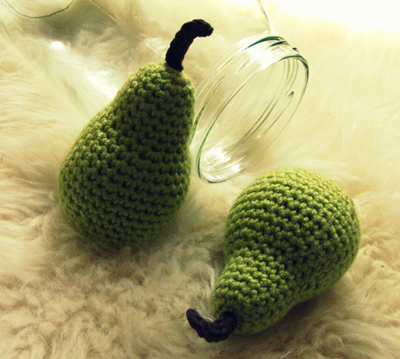 Craftyminx dissected a simple wrist warmer pattern for beginners in a video crochet-along. 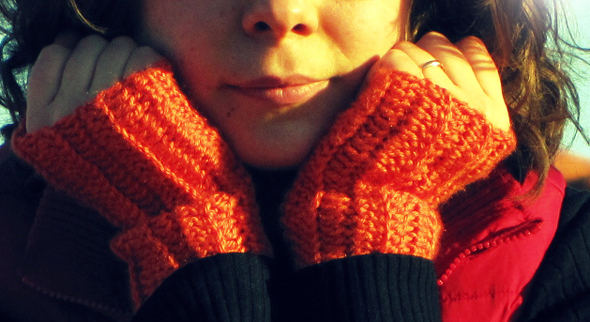 Not only was it a great starter project, the wrist warmers turned out to be very comfy. You can see me sporting them on my profile photo! Although, I must admit that after a week of wearing them in the desert while hiking and camping and a couple of ski trips around here, they are not looking as nice and shiny as they once did. I made a headband using the same technique and it also turned out great. And simple! We love him! He lives on our dresser and keeps himself occupied by sucking up dust bunnies when we're away. And these are all the pictures I have to share right now (totalling three, that's right). I am now crocheting a sun hat for a little girl's first birthday as well as a cami for myself. Will let you know how those turn out! La Casa de Coto over on Etsy has some deliciously colourful poufs. Can you imagine lounging in a pile of those? Inga over at Rockpool Candy boasts this brilliant little rug. Doesn't this crochet bib necklace look like a fun addition to an outfit? Back to Planet June for Mop Top Mascots. Mop Tops!!! So, what do you think? Has any of you been up to some crafting lately? Sharing is good for you (and for my curious self). P.S. We're due for some good weather this weekend in Montreal. Hope that you will have some sunshine as well. Go out and play!